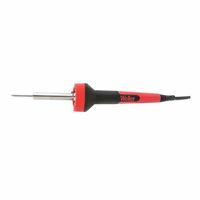 The Weller Soldering Iron with LED Light is a high performance, standard-duty consumer Soldering Iron with the latest LED technology. 3 LED's deliver light to the application for superior accuracy. A triangular from housing captures the LED's. The soldering iron delivers both comfort and flexibility. A round, soft-grip, non-slip handle design helps relax the hand during extended use.